Mag 218 Tower is a 66 floor residential skyscraper with 534 rooms at Dubai, United Arab Emirates. It is owned by the Syrian Industrial businessman Muaffaq Al-Qaddah. 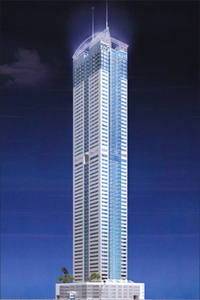 Construction of Mag 218 Tower, which was designed by Dar Al-Handasah (Shair and Partners), started in 2006. It was completed in 2010. The roof height of Mag 218 Tower is 232 metres (761 ft).